"...Yang, Chunsheng (b. 1960, Yunnan), also finds the question of who he is to be fundamental, and his work reveals both Chinese and foreign influences. Unlike the other artists above, however, Yang abandoned the “fashionable” methods of abstract painting for a more realistic approach. 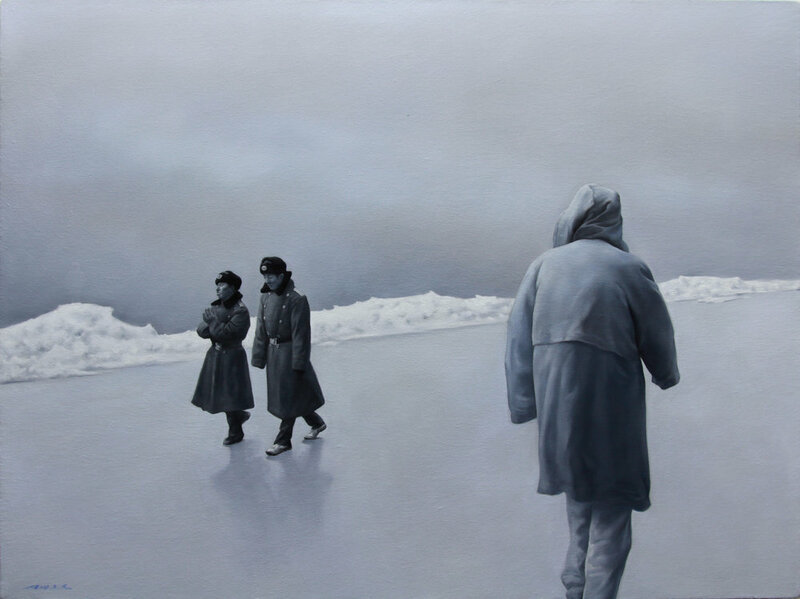 While his work displays a slick realism with naturalistic details and modeling, the mood and effects of his works are surreal and disquieting which may allude to the current socio-political situation in China. 'Interesting paintings can only hint at exploring our own reality,' says Yang, and the scenes of his Beijing Travel Notes series call what we think we know about reality into question. The juxtaposition of detailed figures with flat swathes of minimal grounds, the unexpected contrasts of scale and color, and the skewed placements of figures are unsettling. Set in Tiananmen Square, as indicated by the familiar portrait of Mao Zedong above the archway, Beijing: 3 Uniforms depicts the famous location as a frozen space in mostly icy blue and gray tones. Large, looming figures in dark heavy coats, gloves, and hoods with backs turned guard the scene, their cropped forms providing sharp contrast to the small figure they frame in the middleground. Striking in his color and detail, this uniformed man walks hurriedly across the smooth ground, his entire form a bright red. His disproportionately smaller size and unexpected color as well as the sense of urgency and purpose suggested by his pose create a sense of unease and mystery."